1st-degree price discrimination – charging the maximum price consumers are willing to pay. 2nd-degree price discrimination – charging different prices depending on the quantity consumed. 3rd-degree price discrimination – charging different prices depending on a particular market segment, e.g. age profile, income group, time of use. 4th-degree price discrimination – when prices to consumers are same, but the producer faces different costs. Also known as reverse price discrimination. Premium pricing. In many examples of ‘price discrimination’ consumers are charged different prices for a similar good. In these examples, consumers pay a premium for a slightly more expensive option. For example, ‘premium unleaded petrol’ may cost the firm an extra 1p over standard unleaded, but the firm may sell this premium unleaded at 5p. This is not true price discrimination but uses the same principles – finding customers with more inelastic demand. Its use is widespread, such as first and standard class. This petrol station is offering cut-price fuel for two days a week. The petrol station isn’t even telling you which days have cut-price fuel. The logic is that only the most price-sensitive consumers will take the trouble to find out which two days have cut-price fuel and then drive to the petrol station on those days. This takes planning and only the most price elastic consumers will buy on these cut-price days. Most consumers will not take the trouble to visit the petrol station on those two days. They will continue to buy when most convenient. 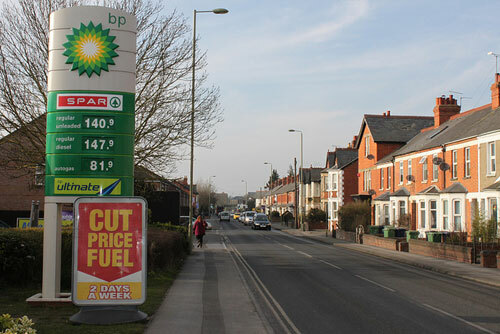 It is also a clever marketing strategy because from a distance, it is advertising ‘cut-price fuel’ you only notice the ‘2 days a week’ on closer inspection. This is a type of third-degree price discrimination. Airlines charge different prices depending on the season and day of the week. During the peak holiday season in August and Easter, the price will be higher because demand is greater and more inelastic. Flights which occur during the week e.g. Mon to Fri will be more expensive because these are typically taken by business travellers. If you stay for over the weekend, the price will be lower, as business travellers will not want to stay over the weekend, just to get a cheaper flight. I often go to New York for a week in October. For a flight from Mon to Fri, the price quoted is usually around £1,500. If I change dates to leaving or arriving on the weekend, the price falls to £450. For electricity, consumers get charged different tariffs depending on the quantity consumed. The first 100 units of electricity consumed are charged at a higher tariff, e.g. 25p kWh. After this first 100 units, consumers get charged a lower rate. The logic is that the first 100 units of electricity are essential, and therefore demand is more inelastic. However, after the first 100 units of electricity, your demand is less essential, so you become more price sensitive. Therefore, the electricity company charge a lower rate. 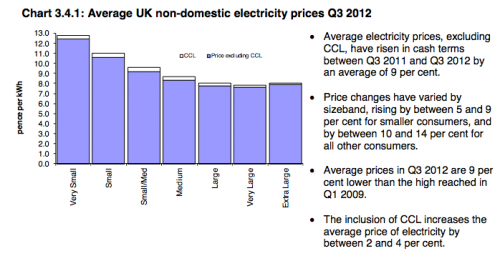 This graph shows that the average price of electricity falls, as firms get bigger and consume more electricity. Firms often give coupons to selected consumers. For example, Tesco may send coupons to regular customers to get special offers, e.g. 20% off selected items. These coupons are often highly targeted to your spending habits. e.g. if you average weekly shopping bill is £50, Tesco may send you a £10 off voucher if you spend over £70. This is an indirect way of segmenting the market. Someone walking into the shop cannot benefit from the lower prices. It is also a clever marketing ploy to get people to come back. A popular way to segment the market is by age category, e.g. students and OAPs often get discounts, such as 10% off. For rail travel, people with railcards can get up to 33% off. The popularity of age discounts is that it is relatively easy to segment the market (you just need to prove your age). Also, different age groups generally have different elasticities of demand. Students and OAPs have lower income than working adults and so are more sensitive to changes in price. Means-tested student fees are a type of price discrimination. If you can prove you have low income, the university may offer lower tuition fees. This is a rare example, of pricing being determined by income; usually, it is considered too difficult. In some tourist cities, residents get lower prices for public transport and parking. For example, in York, residents get lower parking charges. This is because tourists tend to have more inelastic demand. Also, residents use the facilities throughout the year and contribute more taxes. Tourists will have greater demand during the peak holiday season. The higher price for tourists is a way of taking consumer surplus from the inelastic demand of tourists. Some popular car registration plates e.g. 007 Bond, are sold via Dutch auctions. You place a bid for the maximum price you would be willing to pay. 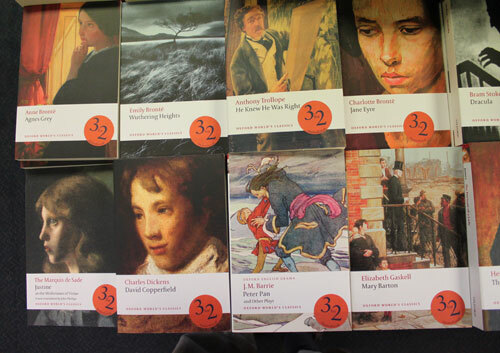 The auction firm starts off at a certain price , e.g. £20,000 and every week reduces the price, until the person with the highest bid is reached. They then get the number plate. This is a type of first-degree price discrimination because, in theory, it takes all consumer surplus. 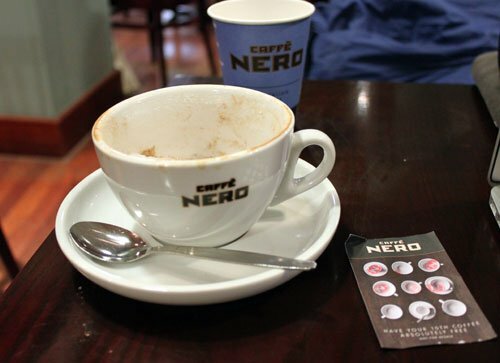 Some coffee shops offer a reward to regular consumers. If you buy nine coffees, you get the tenth free. This is a reward for buying a higher quantity. For one-off visitors to a coffee shop, people are likely to be less price sensitive. Airplanes offer numerous ways to charge different prices for variations on a plane ticket. For example, if you want to choose your seat, you can pay a premium of £30. This is not strictly price discrimination because it becomes a slightly different product. But, it is a way of extracting higher prices from those who want to pay for extras. Lower prices for consumers who buy a higher quantity. Very common marketing technique in bookselling. This entry was posted in economics and tagged business. Bookmark the permalink. These examples are really very helpful for me to understand the concept of price discrimination in monopoly. Daily life related examples are given in this article. Thanks a lot.